Can we have a decent Doctor Who game please? MCV has revealed that the BBC Worldwide is interested in making games based on key IPs after years of sitting back and watching. The BBC has said that it wants to see its biggest brands like Doctor Who, Top Gear, In The Night Garden and more expand into games for all audiences. The games would appear on a range of different mediums such as Facebook, iPhone, Wii and DS. The BBC's last attempt was in 2005 when a PS2 game based on the TV series Spooks didn't quite take off (not counting the pictured Top Trumps game from 2008). We've been reactive to the market in the last few years. There were a few opportunistic licensing deals, but we were largely aggregating and holding onto our properties to wait and see how the market developed. BBC Worldwide has great potential in digital entertainment simply by the quality and variety of content it has to offer. I am extremely excited to be playing a leading role in realising this potential and growing its audience base, through other platforms, around the world. Take a Doctor Who game on the Wii for example, you could use the Sonic Screwdriver controlled via the Wii Remote to unlock doors, set traps or even fly the TARDIS to new locations by waggling. As long as it's better than the last trumpery effort! YES! I've been wanting a Doctor Who Wii game for ages! Please happen! I was just thinking Spooks would make a great game... so they already tried and did a poor job? About time they tried again. There's a lot of potential for games based on BBC television series. Just need the right developer to do it properly. This is good news, but the last thing we want is a load of more of shovelware. YES! Come on! Let's have some In The Night Garden! Does this mean we can have the BBC Micro on the VC? If not, it's still great news that a decent Doctor Who game might finally emerge. This is great news please make a good doctor who game! Nice article mate. Think my younger kids would like "In The Night Garden" games. There are several CBeebies programmes they could work with. Will this be wiiware and/or retail? I've always wondered how you would make a good Doctor Who game (I've been a fan since PBS started showing Tom Baker stuff way back when). Silent Hill: Shattered Memories and Zack & Wiki might be good places to draw inspiration from. The iPhone will probably get the "magic sonic screwdriver" FPSS (sic) game, where the sonic screwdriver opens doors and destroys your enemies or something, but I think a good Doctor Who game needs to be a puzzle-heavy adventure to work. Unless it has some Captain Jack levels, of course. As a Doctor fan, I am simultaneously thrilled and worried. There could be a great Doctor game (and i really like the idea of the Wiimote-as-Sonic Screwdriver idea), but i'd rather they didn't put a game out at all than a poor effort that wouldn't serve the franchise well. That said, i'd probably still get it regardless. 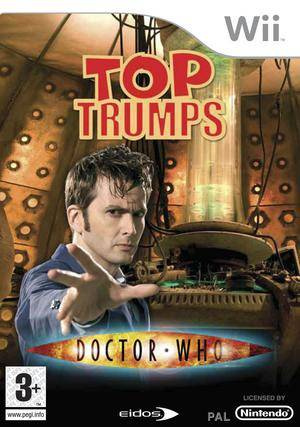 Of course, who knows if there'd be a US release, even though Who has gained significant popularity in the wake of Tenant's run (damn, i still miss him as The Doctor!). Don't care about the others but I would die if they brought out The Adventure's of Makka Pakka. That would be awesome! Primeval would make an awsome game. If they make a Doctor Who game however it should have gameplay spilt between The Doctor, Unit, and Torchwood. You lot are making my mind explode as if i'm some kind of human-time lord hybrid..."aaarggggghhh, the possibilities.....my mind is burning!!!" I saw Top Gear and got excited because I immediately thought they meant the awesome SNES game. Sadly, they meant the crappy BBC show. Doctor Who is awesome though. Crappy BBC show? Your crazy. Top Gear is one of the greatest shows to hit the air waves. Thank God for BBC America. Every Monday night at 8 is filled with watching Jeremy Clark act a fool. I really hope they can pull off a Top Gear game! Top Gear isn't crap, though i don't like two of the presenters anymore. I want to race the virtual Stig on the Wii with the wii wheel! Doctor Who + Telltale Games = Good game (as long as it isn't released on WiiWare!). In The Night Garden + Telltale Games = awesome game (as long as it IS released on WiiWare!). Hustle Wii would be sweet. And of course Doctor Who. How about Flog It! Wii? 2 rounds, first you play as a valuer and try to get an estimated price as low as possible, with a bonus item that allows you to damage the goods without the seller noticing, and then point it out to them. Then in the second round you play as the auctioneer and attempt to sell it off as quickly as possible so that the seller breaks down and cries that her ming dynasty vase is covered in chips she never noticed and just went to a man for a fiver who'll use it as a clay pigeon at his shooting range. And Merlin on Wiiware. Costs 200 points, but has no actual relation to the storyline. You're just dumped on set of the shoot with a lump of wood and have 5 minutes to hit as many of the actors and producers as possible in an attempt to stop them filming. Think Stop Stress but actually fun and with an outcome that everyone actually wants. Wait. Mock The Week DS. Playing as Frankie Boyle, you must run around offending as many people in as sort a space of time as possible. The more people you offend, the higher your power rating, and you get access to more offensive jokes. Be too offensive and you'll be sacked from the BBC, but stay close to the edge and eventually you'll go Hyper Mode and can launch a stream of the most horrendous insults without anyone noticing for massive points. Rated Adult Only. I really hope they get in third party developers. I mean, has anybody ever attempted to play the BBC's 90's game "Destiny of the Doctors"? How could anybody make such an awful computer game? How did they manage to make it so freaking bad? I'd take any Wii shovelware over that piece of lard. Top Gear is awesome! I used to watch it every night with my friends when I was living in Canada. Great memories! That reminds me, I've been in the shops lately and I have found "The Ultimate Red Ball Challenge"- Total Wipeout in everything but the name (even Richard Hammond). I assume it is not made by the BBC, but why the name? Top Gear? As in the Top Gear? Let's hope it won't be bad, or else we will have to EXTERMINATE IT!